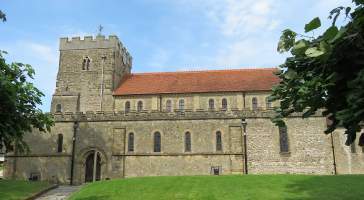 The church is Norman, 12th C and a bit later, and with a 19th Century workover, but with much of the walls and pillars and doors remaining as they presumably must always have been, including one whole wall to the chancel – rather excellent. 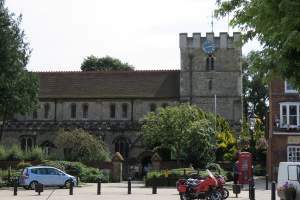 From outside we see a tall nave, low castellated tower, and two low aisles, also with castellations, and a porch which is apparently 19th C but absolutely fits with the older structure. John Jolliffe , d.1771, - presumably the executor of Sir William Joliffe, who paid for the statue outside the church in the square – with short Latin inscription on a black shaped panel, white stone border, acting as apron and with two large carved ogee brackets, one on each side, almost acting as pillar tops. These support a shelf in streaky white, dark, and orangey marble, with a big shaped panel above bearing wreaths and fronds, with a central oval opening in which stands a Greek pot, finely formed, and with a little flame. On top, a pedimentally curved roof supporting the arms. Jane Jolliffe , d.1775, daughter of John Jolliffe and wife Mary, after a long illness, after her parents tried to revive her in the milder Climes of France and Italy. With a poem. Erected by brother Thomas Samuel Jolliffe. Almost square marble panel, with side pilasters, roofless pediment, apron with coat of arms and a small wreath. 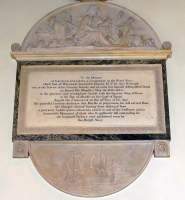 William Jolliffe MP d,1802, who represented Borough of Petersfield, a little oval plaque, unornamented, put up by his son Hylton Jolliffe ‘His Death was occasioned by an Accident awful as unforeseen’. 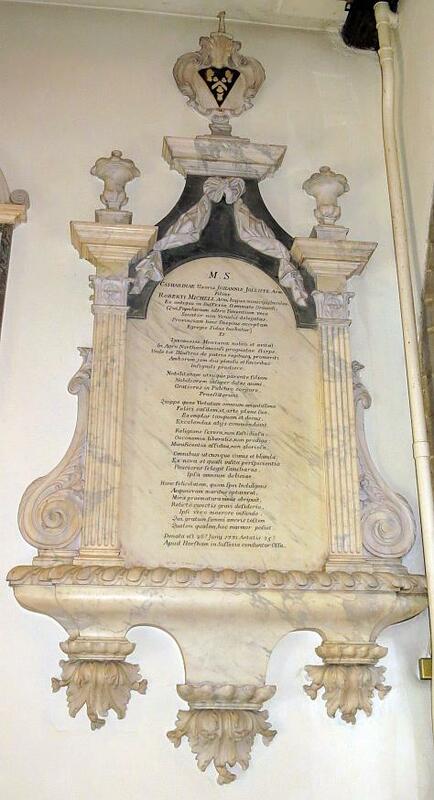 Thomas Samuel Jolliffe , d.1824, with Latin inscription, white marble panel with delicately carved fronds to the side as slightly receding pilasters, unusual, on little brackets which could be pots. Top has a blank pediment above a shelf, entirely broken (ie roofless). Beneath, an apron with little shield enclosing the coat of arms. Hylton Jolliffe , d.1843, Colonel of the Coldstream Guards, and MP. Marble with attached Corinthian pillars, blocky shelf on two brackets below, shelf above, high enough to leave space underneath for shield of arms supported by two lions rampant. The tablet is by the obscure Samuel Colecom of Merstham. Noble monuments to Catharine Jolliffe, d.1731, by Huskisson, and to George Jolliffe, d.1799 . 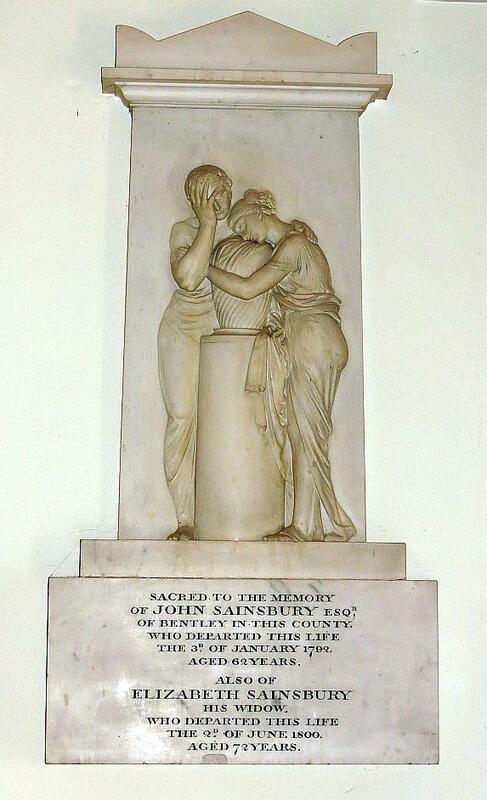 John Sainsbury , d.1792, and wife Elizabeth , d.1800, of Bentley, Hants, with a Classical scene in high relief of two figures mourning over an urn on a pillar. The one, a young woman, embraces the urn and leans her head on it while her hand holds the arm of her husband, who rests his head on one hand, his other embracing her (see picture below). Touching and well composed – superior work. It is the work of Flaxman, no less, and dates from 1801. William Blunt , d.1827, of Buriton, and wife Ann , d.1840, second daughter of Thomas Sainsbury of Newcourt House Devon. Flaxman's empathetic monument to John and Eliz. Sainsbury . 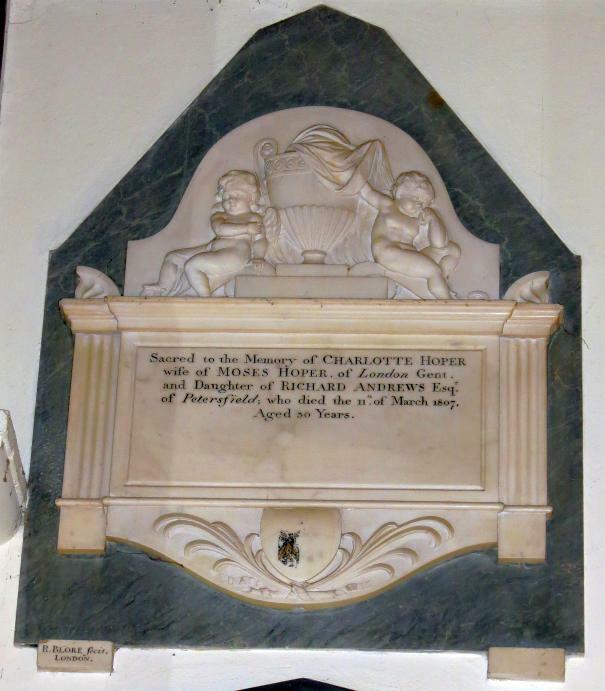 Charlotte Hoper , d.1807, wife of Moses Hoper, of London, Gentleman, and daughter of Richard Andrews of Petersfield. With receding pilasters, curvy pediment with two mourning cherubs beside a proportionately large draped pot, in lowish relief, shield of arms below with tied palm fronds, on a grey backing with rising to an obelisk. Signed by R. Blore. The Blores, father and son, were prolific statuaries, with memorial tablets in churches across the country (see this page). Betsy Andrews , d.1811, wife of Samuel Andrews, daughter of John and Elizabeth Andrews of Petersfield, and Samuel Andrews , d.1855. Panel with corners snipped off, separated from plain fluted pilasters by band of serpentine, draped pot above on black obelisk shaped backing, curved apron below with fronds. Richard Andrews , d.1816, wife Mary Andrews , d.1826, and four offspring, erected by his only surviving child Elizabeth Ann Andrews. As a casket end with fluted pilasters, a narrow stemmed pot on top sheltered by a small palm tree, oddly lopsided in growth, and beneath an apron with shield of arms. All on a shaped black backing, with two small brackets. Jane Andrews , d.1855, daughter of Samuel and Susan Andrews, plain panel with dark veined marble surround on black base panel. Charlotte Hoper, by Robert Blore . Anna Holt , d.1655, wife of Thomas Holt, with some reference to Goodfellow, a plain panel with a Latin inscription. 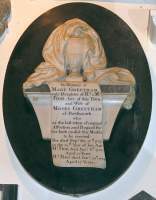 Maria , wife of Thomas Aylwin, d.1693, Doctor of Medicine, and others, with a Latin inscription, plain metal panel, with nice script. Some darker panel above which I could not read. Mary Walden , d.1709, daughter of John and Jane Bloys ‘of this place’, wife of Henry Walden of Portsmouth, and son James Walden , d.1711 in infancy. Stone cartouche with surround of drapery, two winged cherub heads amongst it, two seated cherubs, again winged, at the top, with between them a small shield of arms. At the base, two flowers. William Barnard , d.1777, wife Catherine d.1743, and infant son William . Pale marble panel with brownish marble backing to form receding pilasters, with a broken pediment enclosing a small urn with a flame, shaped apron between two brackets with crossed fronds tied with a ribbon, above a lower bracket. Mary Peryer , d.1782, and husband Edward Peryer , d.1793, oval inscription in a highly decorated rectangular backing, with thin black border then equally decorated receding pilasters, entablature above, bearing relief of two reclining cherubs, the rest of the decoration being stylised floralities in a light, scrolly manner evocative of Louis XIV. On top, pediment, somewhat broken, with happily perfect descending bird, apparently in front of a sunburst, with crown above, one surviving flame to the right. At the base, two heavy curved brackets, with a shield of arms in a heart shape in between, bordered by scrolls and acanthus. 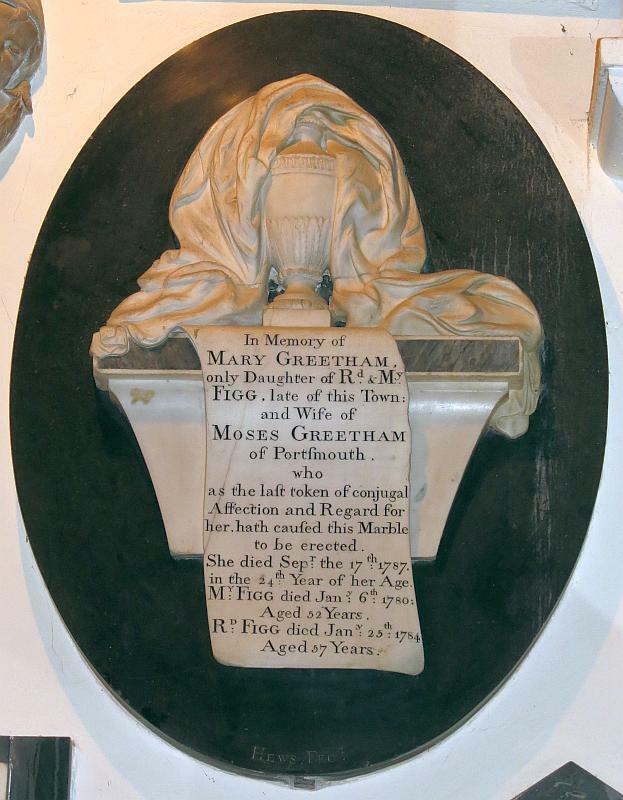 Mary Greetham , d.1787, wife of Moses Greetham of Portsmouth, daughter of Richard Figg, d.1784, of Petersfield, and wife Mary, d.1780. Inscription on a simple scroll, in front of a chest tomb end, with pot on top enveloped in heavy and voluminous drapery, all on a black oval backing. Signed by Hews – not a familiar sculptor. Elizabeth Wingham , d.1790, daughter of William and Sarah Minchin, and husband James Wingham , d.1791, the family apparently having a connection with the founders of Western Australia. Oval panel with rectangular frame, allowing for winged cherub heads in the spandrels, and some leafy designs below, obscured by a board in front of the monument. Heavy shelf above. 18th Century - Mary Greetham by Hews . Thomas Belam , d.1815, unadorned little panel on a later backing. Ann Phillips , d.1827, who left an investment to provide dividends to pay for the monument, and those to others of her family called Eames, to be kept clean and in good repair, with any left over for bread for the moderately elderly (52 or above) poor of Petersfield. Pale panel with dark fluted pilasters, shaped apron of streaky black marble, pediment of the same above, without cover. John Poulson , d.1833, and wife Hannah , d.1787, second wife Sarah , d.1806, and third wife Susannah , d.1833, and two infant children of the first wife. Erected by an only daughter. Panel with streaky pilasters, shelf above supporting nicely draped pot with acorn finial, against obelisk shaped black backing, shaped apron below. The bases of the pilasters have moulded flowers. Martha Parr , 1840, and sister Mary , widow of John Parsons, d.1840. Both dates look as if they have been corrected from 1841. With a simple boxlike chest tomb end with a fine pot on top with two sheaves of leaves emitting from it, or dying flames. All on a black shaped backing. Signed by E Gaffin, of the very prolific London firm, Gaffin of Regent Street. Charles Gower Boyles , d.1845, Rector, simple chest-tomb end with pilasters, on black backing. Signed on one of the little brackets by Aldridge. John Mundy , d.1845, small chest tomb end with ears, and fluted pilasters, on a black backing. Robert Parsons , d.1865, and wife Mary Ann , d.1869, as a scroll on black backing. Another Parsons noted above, d.1840 may be related. The monument bears a hard to read signature but I think it reads ‘Burke, Regent St’. John Meeres , d.1858, white eared chest tomb end with fluted pilasters against black backing, with odd addition of enclosed apron of black and white marble. Thomas Chitty , d. 1858, simple eared chest tomb end against black. Mary Holden (?) blurry, streaked marble panel with border, not quite a pilaster, of grey streaked marble, red and grey band below above a shelf with receding sides and shaped apron, bearing by now blank cartouche. On top a broken pediment enclosing a small pot with arms above, and on the sides, little conchlike lanterns with flames. Henry Clifton Atkinson , and wife (?) Mary Atkinson , which I could not read in the gloom because of an obscuring furniture, with a signature, again not viewable when I visited, to some New Road (London) sculptor. Arthur Temple Lyttelton , d.1903, Bishop of Southampton – like the altar tryptich with mosaic backing and painted Christ as King with shepherd’s crook and holding a lamb. Captain Arthur Henry Wilson , d.1914, East Yorks Regiment, killed in action. A little beaten bronze panel with wreath and fronds. We also note the octagonal font, of obvious antiquity, but how old?. Also the altarpiece, a triptych with mosaic and painting of Christ and angels in lovely bluey green arts and crafts colours, conceivably by Marriott. 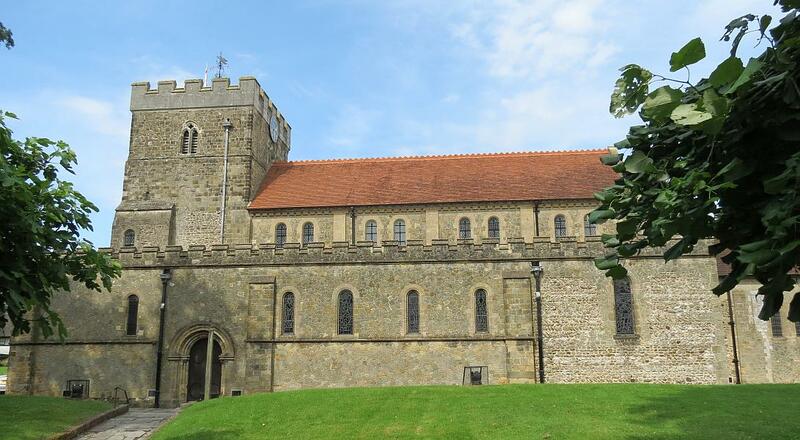 With thanks to the Church authorities for kind permission to include pictures from inside the church; their site is St Peter's Petersfield. St Peter's from the Square .